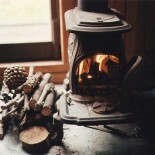 Secondary burning – it burns the particles in the fumes, which in older stoves escaped with the smoke to the atmosphere. Modern construction allows for a higher furnace temperature which burns almost all available gases. Burning fumes using the catalytic converter – the newest and the most efficient method. The catalytic converter burns gases and particles in fumes in temperature lower than in the secondary burning process without the converter. It greatly upgrades the efficiency of the stove. This entry was posted on July 2, 2014 by jbellamy1 in Fireplace, Stove.